Last fall my wife and I decided to take a drive down to Perot State Park to check out the fall colors. It was overcast when we left home but was supposed to clear later in the morning. As we neared Alma, Wisconsin the sun started to peak through the clouds. We decided to stop at Riecks Lake Park to see if there were any Tundra Swans around. Back in the 90’s thousands of Tundra Swans stopped at Riecks Lake during their fall migration. Unfortunately the lake silted up and their food supply disappeared. I’ve been to Riecks Lake many times and have yet to see a Tundra Swan. This day was no exception. However the sun peaking through the clouds made for some great fall color photos with the lake in the foreground. I just received word that my landscape photo, Surfs Up, was awarded first place in the Northern Wilds Photo Contest. This photo was taken several years ago in early January. My wife and I drove up to Grand Marais, Minnesota to watch a sled dog race. As we neared Grand Marais we noticed large waves on the lake. 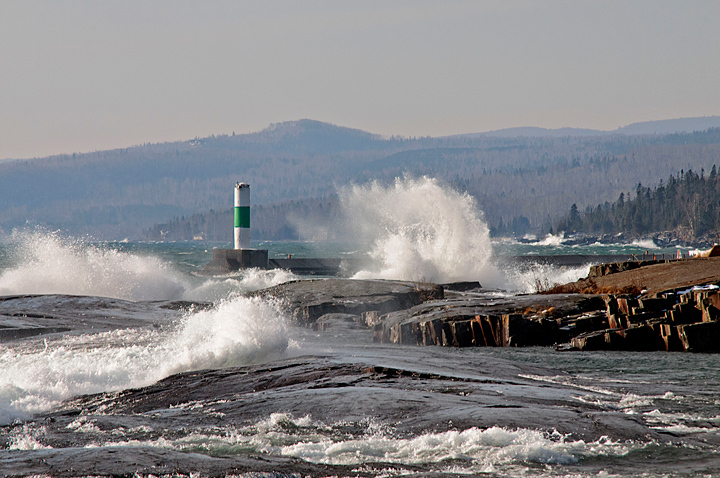 When we reached Grand Marais we drove out to the harbor to watch the waves pound Artists Point and the Lighthouses. The wind was so strong that it was difficult to even stand-up to photograph the waves. Parfrey’s Glen is a close second for my favorite Wisconsin State Natural Area. I is located a short distance from Pewits Nest. After a stop at Pewits Nest we drove over to Parfrey’s Glen. Parfrey’s Glen is a very popular location for class trips but we lucked out. It was late in the day and raining lightly so most of the folks were leaving the Glen as we arrived. While photographing ships from the Arrowhead Bridge I noticed ice patterns where the ice had broken up and froze again. On one section of ice there were frost flowers on top of the ice. We had been traveling so much that we almost missed the fall colors around our home. We were able to capture the early fall colors on a walk through the Hoffman Hills Recreation Area. We had a beautiful sunny day for a walk along the river at Piers Gorge. As the Algoma Montrealais approached the Holcim Docks the Presque Isle was in the process of moving away from the docks. It was a strange sight to see the Presque Isle backing up the Saint Louis River to the Midwest Energy Docks. They Appeared to be using steam to clean the ice off of the bow of the ship. We were in Canal Park on a very cold November morning when the Algoma Montrealais sailed into Duluth past the North Breakwater Light. A short time later we were at Rice’s Point when the Algoma Montrealais docked at the Holcim Docks. I managed to get a few fall color photos as we drove home through Northern Wisconsin from Smalley Falls.